A humane way to catch rodents and high ratings make this our overall favorite. Collapsible for easy storage and made in the USA make this humane trap a great buy. Quick triggers and two sides to catch rodents make this our favorite double-door humane trap. Whether you’re dealing with squirrels overtaking or damaging birdfeeders, nesting in your attic, or adding to the risk of rabies or disease-carrying fleas for your pets, these rodents can be a serious frustration. If you hear scratching, rustling, or clicking sounds in your attic, or see signs of droppings, there’s a high chance you already have an infestation. Squirrels can not only spread illnesses to pets and humans but also damage wiring and insulation. As rodents with front incisors that continue to grow unless they chew, squirrels are always on the lookout for something to nibble on. This can cause electrical problems and even create fire hazards in your home, not to mention expensive damage. So, we’ve rounded up our top four squirrel traps for 2019. Spring loaded door with sensitive triggers. Does not kill squirrels to catch them. Able to catch more than one animal at a time. A three-year warranty is available. Bait hook design could be dangerous to a wild animal. 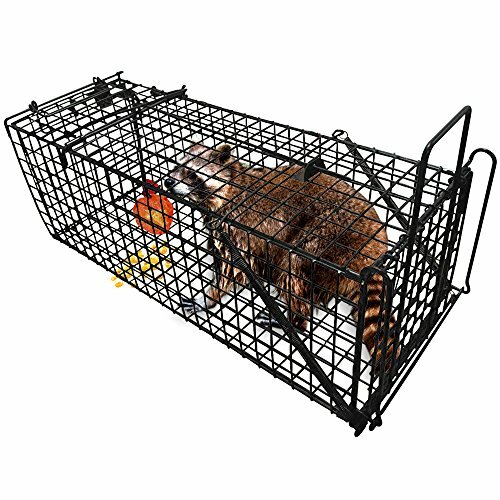 Designed for larger animals such as raccoons, but able to catch rodents. Roughly $58 for one trap. The Amagabeli Professional Humane Live Animal Trap is an excellent option for people who want to get rid of their squirrel problem but in a humane way. The mesh openings are small like any of the best kinds of traps have to prevent animal escapes and stolen bait from the outside of the trap. Just set your trap with enticing bait, catch, and release somewhere far from homes. This can be used in garages, on decks, patios, near wooded lawn areas, in attics, in apartments, in flowerbeds, or even near your front door. Be sure to use gloves and all safety precautions when carrying, removing the animal, and cleaning trap, as any wild animal could carry rabies or fleas. Check trap often. The Havahart Collapsible One-Door Animal Trap features a space-saving design for easy storage when not in use. To set this trap, just lift handle and trap pops into place. This humane trap is constructed of rust-resistant wire mesh with steel reinforcements for resistance to rust and corrosion. This trap also features small mesh openings to prevent escapes and stolen lure. The smoothed internal edges protect the animal and prevent injuries if they trash around. These live animal traps are used by professional trappers and animal control officers. Be sure to use gloves and all safety precautions when carrying, removing the animal, and cleaning trap, as any wild animal could carry rabies or fleas. Check trap often. Smoothed internal edges for animal’s protection. Two-doors to double your chances of a catch. Galvanized steel to resist rust. Made with tiny mesh openings. Handle guard to protect you while carrying. A one-year warranty is available. Around $59 for one trap. Handle-guard to protect your hand from the animal. The Havahart Live Animal Two-Door Cage Trap is designed for the safety of trapped animals. This humane live-catch trap allows for safe, quick and easy catches. 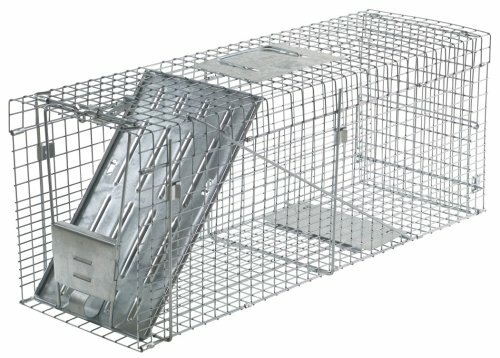 This trap is ideal for trapping raccoons, opossums, and groundhogs, but can catch smaller rodents, as well. It’s constructed of strong wire mesh with steel reinforcements and is galvanized for resistance to rust. Like the previous two traps, this one also features small mesh openings to prevent animals stealing bait or escaping. Two spring-loaded doors with sensitive triggers allow animals to enter from either direction. The solid door and handle guard help protect you during transportation. Be sure to use thick gloves and all safety precautions when carrying, removing the animal, and cleaning trap, as any wild animal could carry rabies or fleas. Check trap often. Ineffective trap for some customers. Also designed for mink, muskrat, and weasel. Around $30 for six traps. No cage—must dispose of dead rodent with gloves by health laws. Designed for smaller animals such as squirrels. 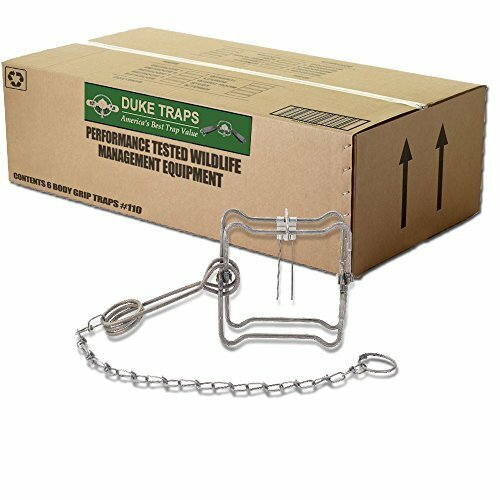 The Duke Single Spring Body Grip Trap utilize rotating jaw snaps to catch and eliminate wild animals quickly. These types of traps are widely accepted by both state and federal wildlife agencies as one of the most effective, humane traps for the population control of certain types of animals (i.e., it instantly kills). Highly rated and very friendly on the budget, these are worth looking into if you don’t care for a live trap or don’t have a place to drive an animal to release them away from populated areas. Be sure to use gloves and all safety precautions when removing animal and cleaning trap, as any wild animal could have still-living fleas. Extreme caution must be exercised with this trap, as the snap is very powerful and can hurt your fingers while setting it. There many diseases that can be spread through squirrel feces if they infest an area like your attic. Similar in the way illnesses can be spread by other rodents, squirrel feces are a health hazard. What initially comes to most people’s minds with squirrels and disease is rabies. Rabies is a genuine threat, as squirrels are one of the animals more likely to contract rabies. Even if you have vaccinated pets, rabies can still result in feral behavior and bites or scratches. However, rabies is by far not the only health risk from squirrels. There many diseases that can be spread through squirrel feces if they infest an area like your attic. Similar in the way illnesses can be spread by other rodents, squirrel feces are a health hazard. The largest concern with squirrel waste is the presence of leptospirosis, which is a bacterial illness that is transmitted through the feces and urine of rodents. Salmonella is another sickness that you can catch quite easily from squirrel waste. Salmonella will often cause symptoms like diarrhea and vomiting, but it is rarely fatal. Plague might seem like something that is ancient history, but it’s still existent today. One of the largest risks of the disease are fleas on rodents such as squirrels. Moreover, the plague is not only active in the most remote or poverty-stricken areas of the world. Plague actually occurs in the western United States, especially in areas such as Arizona, California, Colorado, and New Mexico. The bacteria that causes plague is spread by fleas and rotates naturally among wild rodents. Plague can also infect humans and their pets. Bubonic is the most prevalent form of plague. Bubonic plague most often occurs after being bitten by an infected flea—usually from rodents or from a flea infestation that came from rodents. The main indicator of bubonic plague is a swollen, sore lymph node, most often in the groin, armpit area, or neck. Other symptoms can include high fever, the chills, headaches, and overwhelming fatigue. A person will usually experience symptoms of bubonic plague one to six days after being infected. Septicemic plague happens when plague bacteria spikes in increase throughout the bloodstream. Symptoms include a high fever, extreme fatigue, light-headedness, and usually abdominal pain. Septicemic plague can rapidly lead to shock and organ failure. Pneumonic plague occurs when plague bacteria overtakes the lungs. Pneumonic plague, if not treated quickly, is almost always fatal. Squirrels are often harmless and for many people pose very little threat in yards. However, if you reside in a region where plague is on the rise, you have pets that rest or roam in the same areas as squirrels, or you have a squirrel nesting in your attic or insulation it’s best to protect yourself, your pets, and your home.